From the start I employed my sisterhood of godly women to pray for me. I needed their intercession and support. They did not disappoint. The community of friends the Father has given me are like a mighty army. 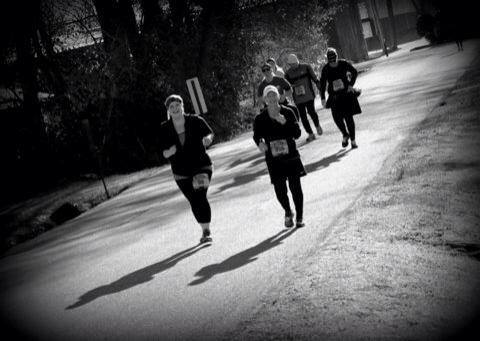 They began to send me scripture, pray petitions of strength over me, and spiritually chose to run this race with me. You may have heard the phrase “love shows up.” My friend Becky was love showing up. Shortly into my training, when I felt I was at my weakest, Becky showed up to run the long runs with me. Becky is a fierce competitor. She has a coach’s heart. She know hows to motivate, push and challenge. She’s also a mighty warrior of God and knew when I needed to be reminded of who I am in Christ. She spoke the truth of scripture over me, frequently reminding me that God did not give me a spirit of fear but of power, love and of a sound mind. As the training progressed, God continued to demonstrate his strength in my weakness. I continued to chase after Him, knowing that through this process of training He was renewing my heart and transforming my mind. As long as I can remember I’ve known the verse from Hebrews, “Therefore, since we are surrounded by such a great cloud of witnesses, let us throw off everything that hinders and the sin that so easily entangles. And let us run with perseverance the race marked out for us, fixing our eyes on Jesus, the pioneer and perfecter of faith. For the joy set before him he endured the cross, scorning its shame, and sat down at the right hand of the throne of God. Consider him who endured such opposition from sinners, so that you will not grow weary and lose heart.” The Father told me to run so that He could demonstrate this verse in vibrant living color for me. The world is watching. People around us are watching to see if we really believe that Jesus is who we say He is. Do we really believe that our weakness is made perfect through His strength? Do we really believe that He is able to do immeasurably more than we ask or imagine? Is He worthy of our risk-taking, exhaustion, and pursuit? My race looks different than yours. A sure fire way for me to get tripped up during my training was to take my eyes off the goal and focus on all the other runners around me. They ran so much faster than me. They looked better doing it. They seemed to have endless energy and confidence. The Bible is clear, “let us run with perseverance the race that is set before us.” Not anyone else. Us. The Father has a plan for my life and it’s unique and I’m only able to run this race when I keep my eyes on Him. He is the reason for my Faith. When I take my eyes off of Him, I falter every time. Two are better than one. We were not meant to do life alone. God has so graciously surrounded me with friends who love Jesus and love me and continually point me back to Him when I get off track. The finish line is glorious. Training for the half-marathon was one of the hardest journeys I’ve ever taken. Race day was invigorating. The Father answered my prayers and gave me strength and joy. I basked in His goodness. I finished the race, running every step. I did not grow weary nor did I lose heart. The joy of the Lord was my strength. God may not be asking you to run a half-marathon. But He is calling you out, whispering your name and charting a course for your life. I don’t know all the details of the race He has for you, but I know He can be trusted and when we put our trust in Him, the finish is glorious. So dust off those running shoes and get moving. I’ll see you on the trail.